The ghost town of Monte Cristo has come alive again after pollution cleanup. More than 8,000 cubic yards of contaminated material have been removed from the mining boomtown of the 1890s and early 1900s. 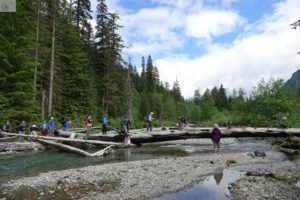 Two Tuesday Trekker groups combined yesterday to visit the site, an 11-mile round-trip walk with the added drama of a log crossing. 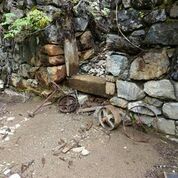 We followed the old mine to market road and the roadbed of the Everett to Monte Cristo Railway into town. The bridge over the South Fork Sauk River has long been washed out, and hikers must wade across at low water in late summer or cross a large tree that has been downed over the river. The log is fairly wide, smooth and dry but narrows at the farther end. 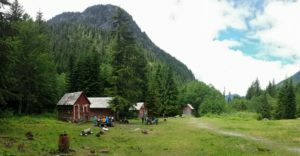 Once at the townsite, we lunched in the basin at the foot of the towering mountains that provided gold and silver to the hopeful prospectors, financiers, and investors. 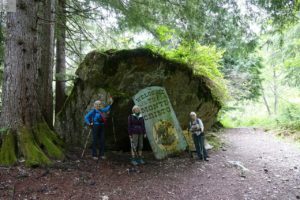 Since the clean-up of toxic materials (lead, arsenic, copper) that leaked into the soils and creeks, the Monte Cristo Preservation Society has added more interpretive plaques, allowing hikers to roam Dumas Street on a self-guided tour. Alexander Dumas was the author of The Count of Monte Cristo, after whom the town was named. The building called the concentrator climbed the mountainside. 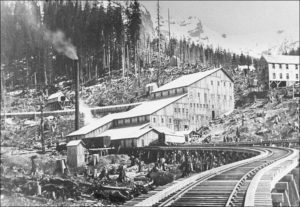 Five levels of rollers, washers, and separating tables reduced the ore to “concentrates,” which were then loaded onto rail cars carrying them to the smelter in Everett. The remains of the concentrator are not to be missed. While writing Walking Washington’s History: Ten Cities, I was struck by the importance of rivers to the development of cities in Washington–the Puyallup in Tacoma, the Duwamish in Seattle, the Yakima and Naches rivers for Yakima, the Columbia for Vancouver and the Tri-Cities, the Snohomish for Everett, the Spokane for Spokane. When most of these cities were founded, in the late 1800s, rivers were the transport of choice for people and freight. Over the decades, many of those rivers have been dredged, straightened, drained of their power, and polluted. Although it is now an industrial powerhouse, the lower five miles of the Duwamish River is also a SuperFund site,requiring millions of dollars of clean-up to restore it to even a semblance of its original health. 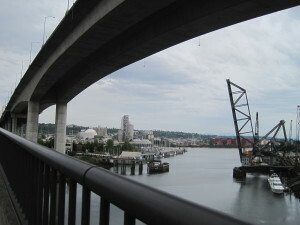 The West Seattle bridge soars over the mouth of the Duwamish River. The flow and falls of the Spokane River had been so drained for use as a power source and its islands covered with railroad structures that some residents hardly knew it existed. The mouth of the Puyallup River in Tacoma was renowned not for the smell of a tideflat at low tide but for the aroma of pulp. Gradually attitudes toward the rivers in our midst have changed. We have reclaimed them as common space. When Spokane hosted a world’s fair in 1974, the citizens reclaimed the riverfront. With cooperative efforts, the city pulled up railroad tracks, restored much of the river’s flow, and cleaned up pollution. The result is a riverfront of trails and community gathering spots at the city’s historical center. 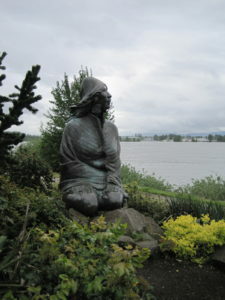 Ilchee, of the Chinook Nation, gazes out over the Columbia River. Although still in the process of a massive cleanup, Seattle has a Duwamish River bike trail that goes for miles into the Puget Sound lowlands. Tacoma’s riverfront walk skirts the Thea Foss Waterway, carved from the river and tideflats. Vancouver’s Columbia River Renaissance Trail winds through the early maritime explorations and trade of the lower Columbia River. 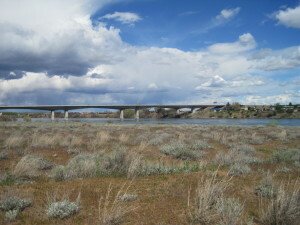 The Yakima Greenway follows the Naches and Yakima rivers as they converge on the edge of Yakima. These walks and more are described in an article I wrote for Northwest Prime Time’s June 2018 issue. Read it here.